Provide comfort for the family of Roddy Gillis with a meaningful gesture of sympathy. 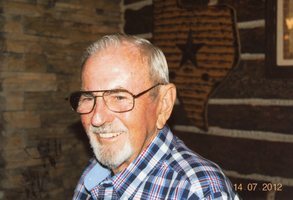 Roddy Gillis, age 82 of Rockwall, TX passed away on Thursday, March 14th, 2019 in Mesquite, TX. He was born on June 11, 1936 in Sulphur Springs to the late William Paul Gillis and Cora Caveness Gillis. After graduating from Winnsboro High School, Roddy married Kay Spivey on May 28, 1955. He served in the U.S. Air Force for four years, working as a tail gunner on B-36 aircraft. After his active service he continued in the AF reserves, and began his career as an electronics technician with General Dynamics in Ft. Worth, then L.T.V. (E-Systems) in Garland, Texas. He and Kay started R and K Camping Center in 1969, with the original office in a tent camper. Kay ran the business during the weekdays while Rod continued to work at E-Systems full-time. The business grew, but Kay was stricken with cancer and died August 14, 1975. Without his partner, Roddy and his teenage children decided to continue the business. Rod took the ultimate leap of faith, quitting his career at E-Systems to further the family enterprise. The business grew and was very successful. Roddy had a tremendous work ethic, working continually until his death. He helped many people achieve their goals as well, and was a great mentor to countless friends. He loved to travel and visited much of the world including Europe, Asia and Australia. He married Amanda Richter who loved him and worked tirelessly alongside him until his death. Roddy enjoyed fishing and camping, and was passionate about cars and airplanes. He was a Freemason and a member of the Shriners. He is survived by Amanda Richter, children Paula Lawrence (David), Mark Gillis and Cheryl Gillis; sisters Lila Fay Sparkman, Sue Spence and sister-in-law, Sherry Spivey Ruff; grandchildren Kay Geffers, Justin Gillis, Barry and Morgan Lawrence; five great-grandchildren, and numerous nieces and nephews. He will be greatly missed by numerous friends as well. Visitation will be held on Sunday, March 17th, 2019 from 1:00-2:00 pm at Beaty Funeral Home, 816 W. Broadway, Winnsboro, TX 75494. Funeral Services will be held at 2:00 pm with Bro. Ronny Spence conducting. Interment will follow at Smyrna Cemetery in Winnsboro. To send flowers in memory of Roddy Paul Gillis, please visit our Heartfelt Sympathies Store. We encourage you to share your most beloved memories of Roddy here, so that the family and other loved ones can always see it. You can upload cherished photographs, or share your favorite stories, and can even comment on those shared by others. Provide comfort for the family of Roddy Paul Gillis by sending flowers. So sorry for your loss. May the scriptures at John 5;28,29 and Revelation 21:4 bring hope and comfort.